Faerie as the prompt for any art medium really leaves the world open to the imagination as there are so many incarnations of them. That was the challenge issued by Caroline of the team at Art Elements this month. I've long loved the world of magic and the mythical realm and was so overwhelmed by the possibilities even within the boundary of fairyland that I didn't quite know where to begin. While on a bit of a shopping excursion this week, I happened upon the Green Girl Studios display at Hobby Lobby. 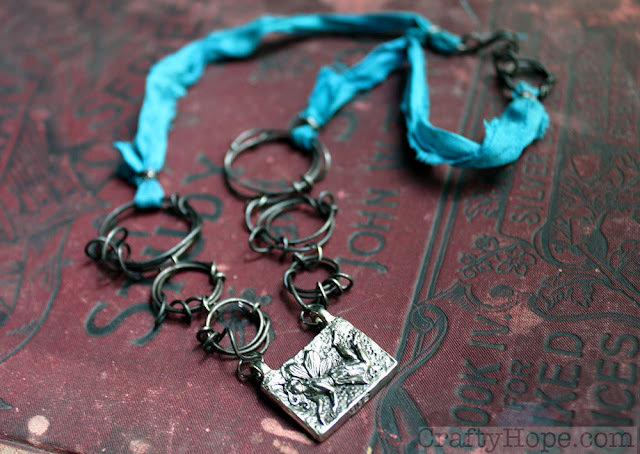 The pewter pixie pendant there called out to me and came home with me as a starting point. However, I was still stumped as to what to do with her, so I let my mind wander. The pixie depicted on the pendant seemed to be floating in mid-air; and fairies, in general, have an ethereal quality. With that in mind, I didn't want there to be much fuss to the piece I created. I never even pulled out a single bead. Instead, I was drawn to my blackened steel wire and compelled to make bubbles. At first, I thought I would just make one or two of the bubbles but after the first, I knew that these messy swirls of magic would be the main element to my design. I used only a glue stick and a tapered paintbrush to help form the shape of the circles, then wrapped them haphazardly to finish them. Gunmetal jump rings link them together. 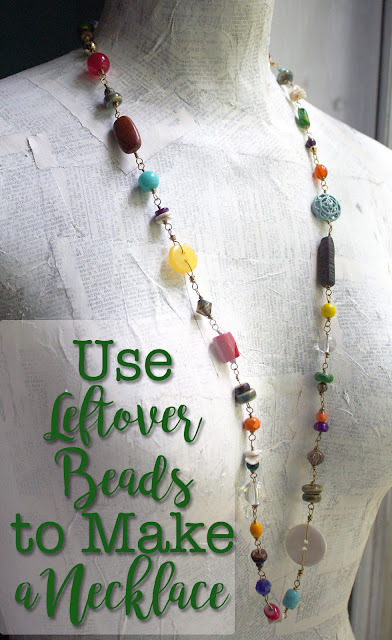 To complete the necklace and give it some softness, I used recycled sari silk in a dreamy teal blue. As well, I created my own hook and loop closure with more of the blackened steel. The swirly, messy circles definitely keep the necklace feeling light while exuding a sense of magic bubbles floating to the sky of blue silk. I'm still amazed at how quickly and perfectly this necklace came together. It had to have been magic. 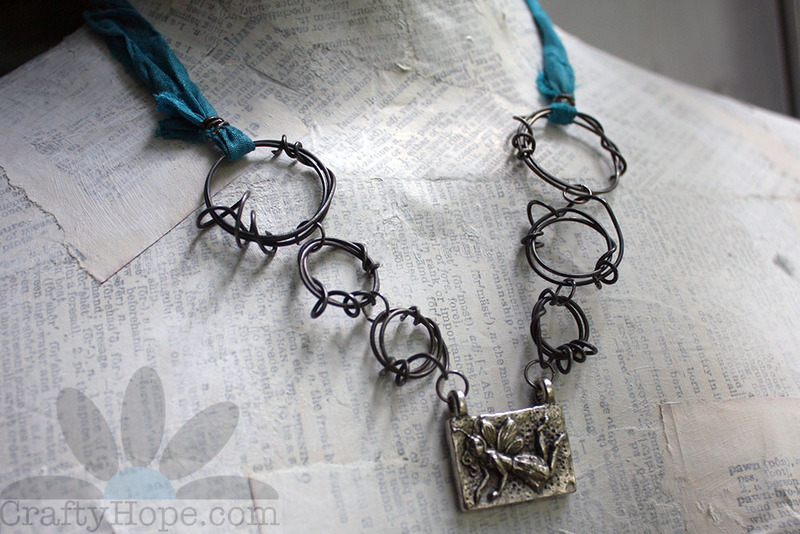 Once the necklace was done, I was still itching to create with the theme. I've always had a thing for fairies. In fact, for a while, I had a second blog (now closed) that I called Fairy Creative. There are at least three fairies, in some form, in my bedroom. And, I shared my process for creating Fairy-themed Altered Playing Cards some months ago. So, I knew that the possibilities for coming up with another design were there. However, I wanted to make something that wasn't jewelry. It didn't take long for this beauty to emerge. Without any direction, I dug through a box of elements for mixed media art and pulled out a few materials that I thought would work with the theme. The little mushrooms caught my eye first followed by the Dollar Tree wood butterfly form. When I spotted the paintbrush, the whole idea came into focus. I've long seen altered paintbrushes in mixed media art circles, and have been wanting to make my own. This was the perfect opportunity. Using basic scissors, the wood butterfly was cut in half, and the butterfly's center was snipped away. 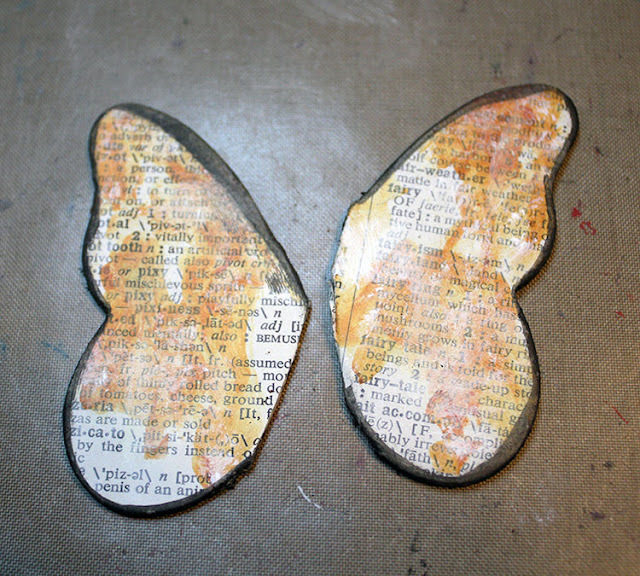 The remaining wings were painted with a layer of black gesso before I added my trademark dictionary text with Mod Podge. If you look closely, you'll see that the definitions for pixie and fairy are included on the wings. The paper was toned down with a whitewash of acrylic paint and water. To echo the rust on the paintbrush, I added splotches of quinacridone/nickel azo gold fluid acrylic paint. To define the shape of the wings, I used a black Faber-Castell Pitt Pen to outline them. These were sealed with more Mod Modge. Creating a face for my paintbrush fairy baffled me for a bit. I sorted through more of my mixed media assemblage elements for something that would work. 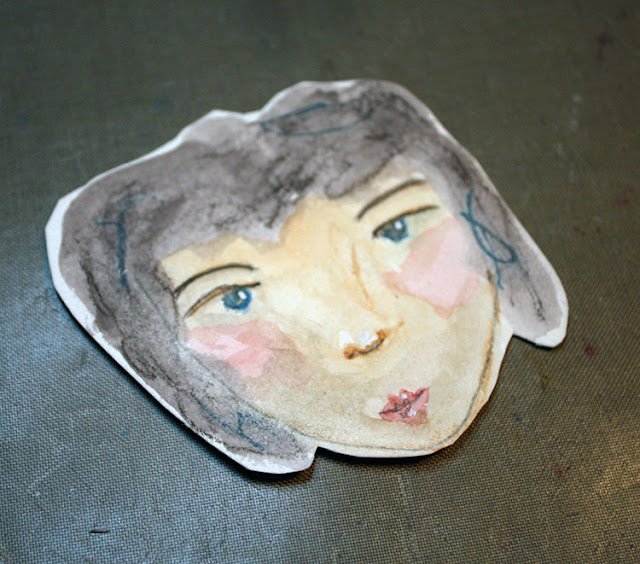 In the end, as you can see, I decided to create my own face on watercolor paper with Derwent Inktense Watercolor Pencils. This was also sealed with Mod Podge on the front and back. Then it was time to assemble her. 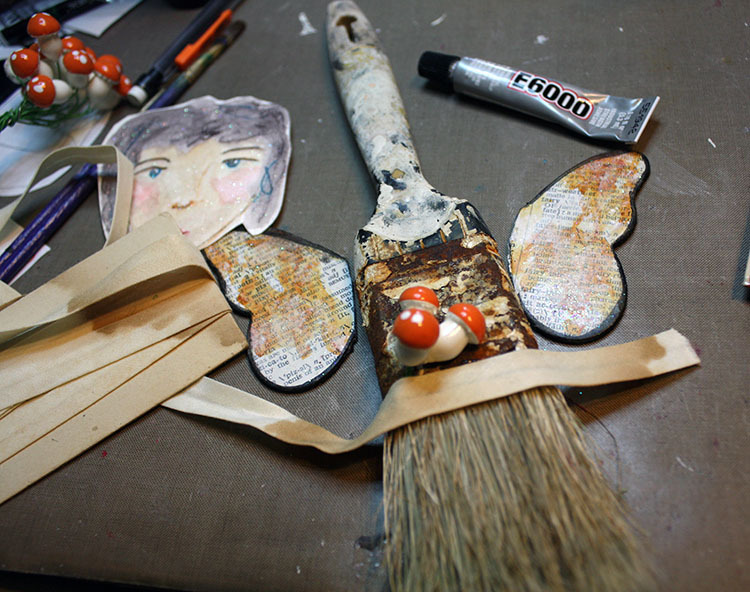 I did add a touch of fine glitter to the wings and face to evoke the magical quality of a fairy. The mushrooms, thrifted seam binding, and buttons (not pictured) were added to the mix. Everything was glued on with E6000. Once most of the elements were added, I decided she needed a crown of some sort, so I created one with more of the blackened steel wire I had used in the necklace along with the mushrooms, mother of pearl buttons, and black craft wire. 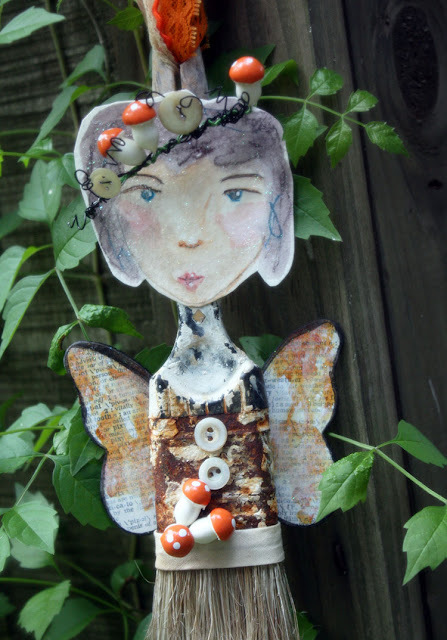 As well, lace, seam binding, ricrac, and recycled sari silk were looped through the hole in the paintbrush handle to create a way to hang the fairy. The mother of pearl buttons were added on impulse as I have a penchant for and large supply of them. I think they worked out perfectly to help define her torso. She definitely has a woodland fairy vibe that I totally dig. But, we've joked that she's a button mushroom fairy. I LOVED the Faerie challenge this month as it allowed me to work with a theme that I adore and know well. Even so, it stretched my imagination and creativity; especially since I created both of these pieces in the rush of a single day. Sometimes being under pressure is just the kick in the pants I need. Below is the list of participating artists for this challenge. Make sure to check out what they created for this magical theme as well. I've also shared this post on the following link parties: Craft Schooling Sunday, Nifty Thrifty Sunday (where I'm featured! ), That DIY Party, Made by You Monday, Mad Skills Party, Inspiration Monday, Beautifully Made, and Recipe and DIY Linky. 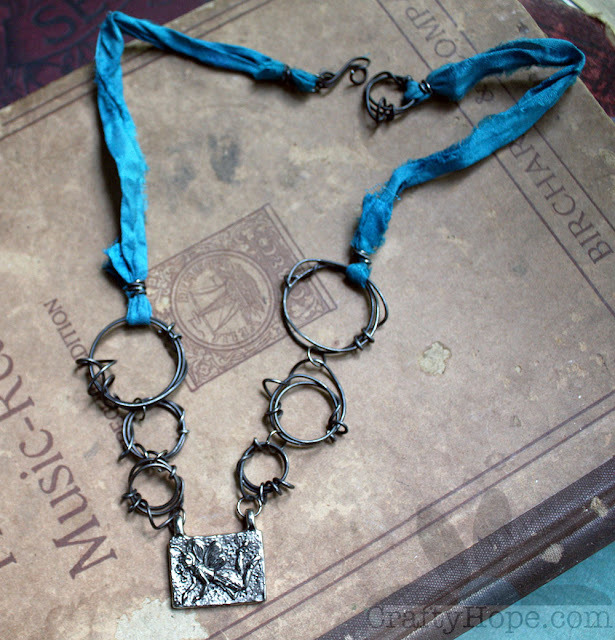 I love your magical necklace design, the blue silk really does give it a dreamy feel. 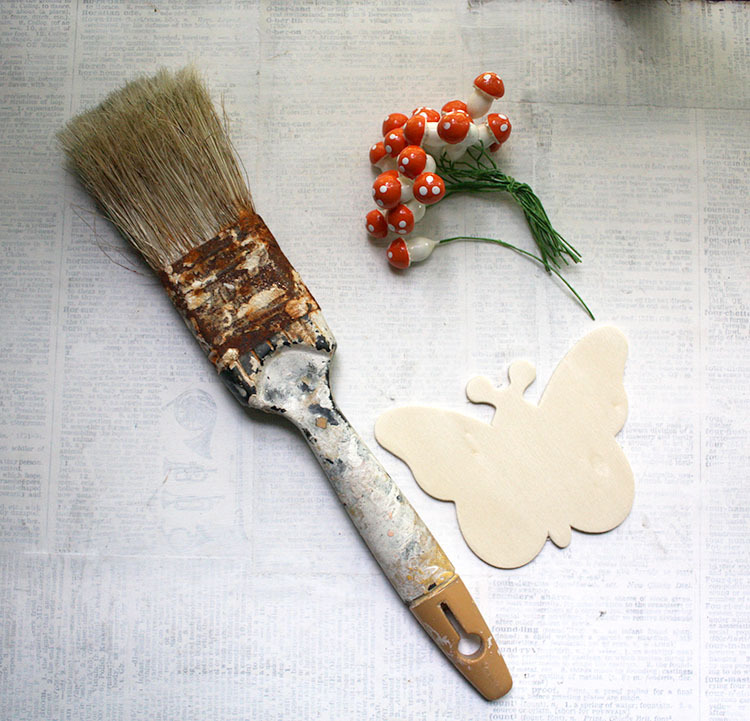 And the paintbrush fairy is fantastic... I laughed when I read her name. Button Mushroom is perfect! Really glad the theme inspired you. I'm still going with it, it was great fun! OH I LOVE THE PAINTBRUSH FAIRY!!! she is awesome!! Laney, Thank you!! She totally came out of left field, but as soon as I dug out that old, found paintbrush, I knew what I wanted to do. I'm so glad you like her too! Thanks for taking the time to hop by! I just love how you created the necklace. Simple yet so effective with the wire circles/bubbles. And the paintbrush fairy is adorable. So clever! Her mushroom crown is the icing on the cake. Cathy, Thank you! I definitely didn't want that necklace to be too fussy. Keeping it simple with the wire and silk really worked out. And, kept the time to make it down to a minimum! As for the crown...she almost didn't have one. I hadn't planned on it, but that area of the paintbrush felt empty and lacked magic (even with the glitter). It really did add a special something to the piece. Thanks so much! Both the necklace and your little fairy are so sweet! When I saw the blue ribbon, it made me think "sky" immediately before you even mentioned it. Such a wonderful contrast. Aw, thank you, Cat. YES! I'm so glad you saw sky too. The pendant looks so much like she's flying that I had to give her a little blue to aim for. ha. I love the freeform wire circles on your necklace. They make me think of brambles in an overgrown garden; the kind of garden where a fairy would live. 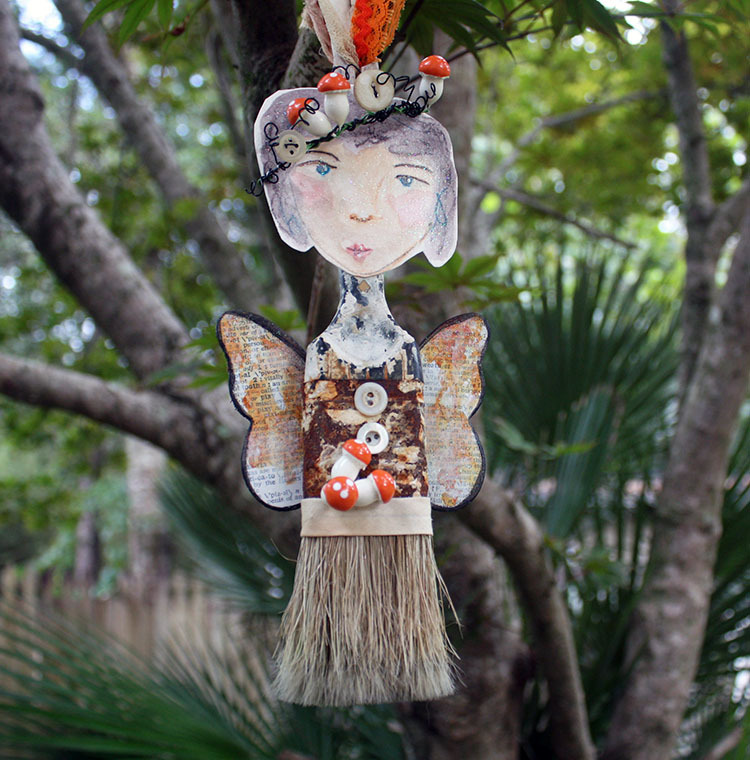 The paintbrush fairy is marvelously whimsical. Every detail is perfect. Tammy, Oh, that's a perfect analogy for the rings. Maybe they're reminiscent of the vines I have climbing all over my property. I'm constantly hopeful that we've got some fairies residing out there. You are too kind about the paintbrush, but I am absolutely smitten with my first attempt at this altered art type. Thank you so much!! 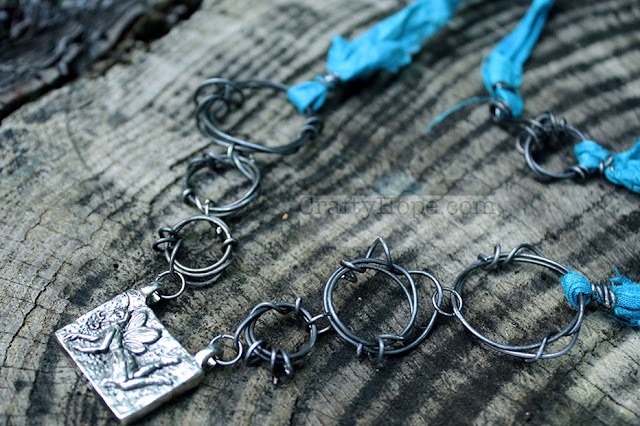 I really love the necklace the design is just wonderful and your paint brush fairy is just as charming! Nicky, Your kind words mean so much to me. Thank you. I really enjoyed this challenge. My only regret is that I didn't focus on it sooner to create more magic! I love that we both had first thoughts of Cynthia and Green Girl Studios, I think she is the epitome of Fairy-ness. Your necklace turned out beautiful! I watched your video of fairy altered playing cards and loved it. (Great job of narration btw, I often have issues with narrators, but you are very well spoken.) You had a very fairy month! Alison, Thank you so much for all your sweet words. I'm so glad you like my narration. I've been working on getting better at both giving the information and letting my personality shine through at the same time. I've always been one to stumble over words, so I just let that be since it's how I speak. I'm glad to hear you enjoyed it. Yay!! :D Thanks so much for popping in. Wasn't this a fun challenge? I absolutely love your kinda rustic necklace. In certain pix the wire has a bluish tint. I wonder if it's just an optical illusion created by the ribbon? 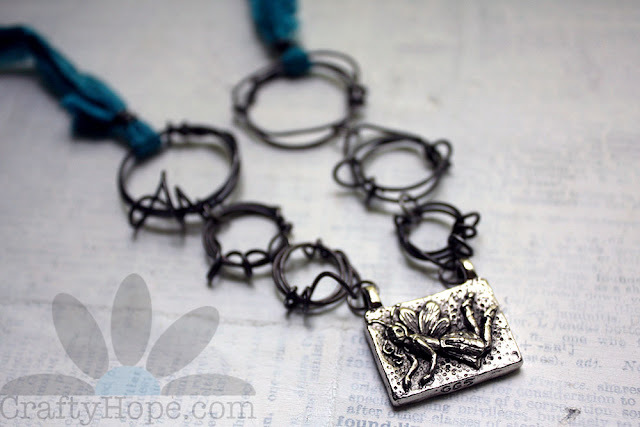 And mixed media pieces made with what's at hand are always inspiring. I agree that the buttons pull the look together and create your 'button mushroom' fairy!! Jill, Oh, I'm so glad I brought a smile to your face. These two projects were so enjoyable to make. I think I'm going to have to just make myself think in terms of themes more often than just with challenges! Thank you so much for taking the time to stop by and comment. It means so much! I absolutely love your paintbrush fairy. She is so cute and I can just see her hanging in some fun spot on your property. Well done! I love anything by Green Girl Studios and I had no idea Hobby Lobby carried them. Kathy, Thank you!! I would love to leave her out hanging in the property, but I just don't think her paper head would withstand the humidity, nevermind the rain. Ha! Since she's kinda Autumn-colored, I may add her to some decorations in our living area for now. As for the GGS stuff at Hobby Lobby, YES! They started carrying it several months ago. In my local HLs' it's right with the Vintaj stuff. I love that it so accessible now. Thanks again. The necklace is unique and ethereal, I love the use of a sturdy material (wire in your case) for the creation of something that looks weightless, it takes lots of creativity! I have never managed to drift away from jewelry in those challenges and admire everybody who does, your paintbrush-mushroom-button fairy is adorable! The bubbles are perfect for your GG sprite. But lets talk about the sheer magic and joy in the Button mushroom fairy. Heavens. She is utterly charming! Oh, thank you, Jenny! I had only planned to make the necklace, but something told me to push on. I'm so glad I did. She was a complete surprise to me. I'm so happy you see the joy in her too! Thanks again! 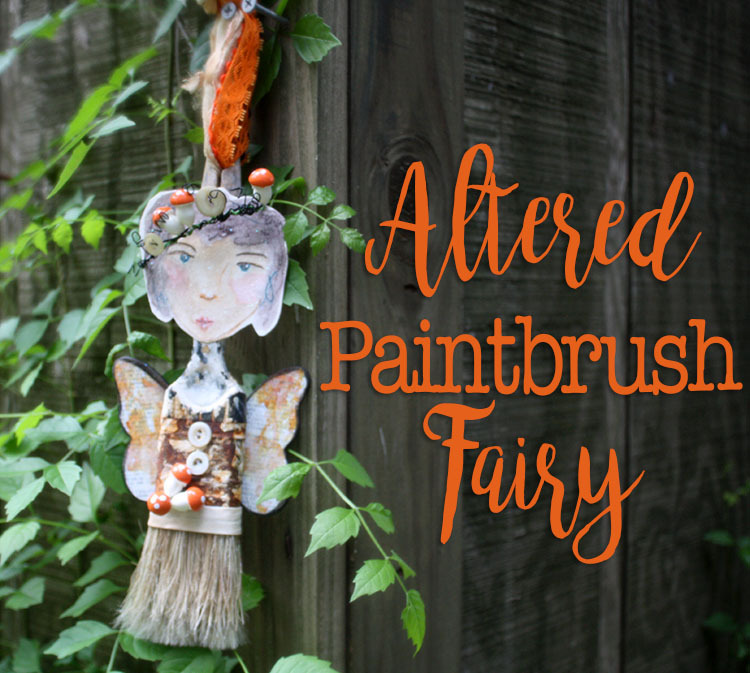 The necklace is fabulous and I adore the paintbrush fairy. Victoria, Thank you so much! My little paintbrush doll doesn't compare to your amazing dolls, so your kind words mean so much. Thank you. Thanks so much for sharing on craft schooling Sunday, been needing some of your creative touch at the party, please come back again!